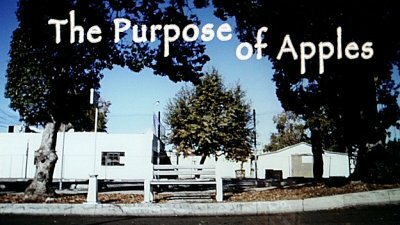 Your new movie The Purpose of Apples - in a few words, what is it about? The main two themes are loneliness and hope. It's the story of Caden, who has given up on love after finding his girlfriend cheat on him. He sits on a bus stop frustrated and unsure of where to go when Ethel arrives. Recently widowed, the two sit on the bus stop. When Ethel offers Caden an apple to eat they find that even though they are two different people, they have something in common. The stupid question I just have to ask: Do you eat your apple a day? And what do apples mean to you, personally? That is actually a good question. I don't eat an apple every day. I suppose I should though. There is no specific significance with the apple either. I do have a hint of religious and spiritual undertones in almost all of my writing. That is because I believe that people are governed by their faith and beliefs. When I started writing I was more trying to figure out a vice to use to make Ethel talk to Caden. An apple seemed simple... but as I started exploring the characters and the story more I realized the apple meant more to Ethel. It was no longer simple. What were your inspirations when writing The Purpose of Apples - and was any of it based on personal experience? There were no particular inspirations. I just wanted to make it simple to shoot. So one basic location seemed the best idea. And I suppose there is a piece of me in everything that I write - that is part of the process of writing; the process of being an artist. You are generally much more known for your work in horror - so what prompted you to pick up drama with The Purpose of Apples? Next to horror, drama is my favorite genre. I always feel there is a bit of drama in horror and a bit of horror in drama. But more than that, I love good stories and I love putting good characters into situations and seeing how it will play out. Well I am big on collaboration. So I let the actors talk and feel out their character for a bit. It's amazing how the actor can get into the head of the character and make them come to life. I see if all the time when I am on set as a script supervisor. I also like when my cinematographer presents ideas. Each department has something to bring to the table and I love to hear those ideas and then see what helps the story. My editor and sound designers and composers are always so amazing in post production as well. On set, I just try to guide the actor through the scene. It's up to them to deliver the performance but I feel it's my job to get them there. It's very symbiotic. Your movie was almost entirely filmed at a bus stop (or what appears to be one) - so what were the advantages and also the challenges filming there? Well filming at one location is easy for budgetary means. But the challenge is to make it interesting and not boring. Two people sitting and talking can be tedious. I kept Caden moving because he was frustrated and wanted to be left alone... but at the same time felt alone and wanted someone to talk to. When we did the flashbacks we tried to keep them moving to be a counter-balance to the main story. Because these actors were phenomenal. In truth I cast Andrew J McGuinness as Caden a few years ago when I tried to shoot The Purpose of Apples the first time. When my producer Cuyle Carvin (who also helped me produce Ax) [Cuyle Carvin interview - click here] told me he wanted to help with this film I was finally ready to direct it. But we decided to start over to be fair to the project. That meant... Andrew would have to re-audition. He was very professional about that. And he came back and did an even better audition than he did the first time. He really fought for this role. Both Cuyle and I were impressed with his vulnerability, which I felt was important for Caden. As for Starr Gilliard, she was great during the audition. She was very motherly and tender, which I think was from years of being a teacher before becoming an actress. She understood the character. In fact, she wore the exact same outfit during filming that she wore in the audition. I used Todd James Jackson as the flower guy. He was in Ax and the first actor I have directed. He is in all of my movies. In fact, the name tag he wears is his character name from Ax. For Ethel's flashback I found 2 sweet natured actresses when I auditioned Calida Jones and Kira Powell. Calida was great as Young Ethel... and Kira had enough attitude to pull of her best friend Golda. As for Young Herb and Chauncey? Cuyle knew Jonte LeGras and asked him to do it. A friend suggested Granison Crawford to play Herb. I knew Granison as a comedic actor. I gave it a chance. He and Jonte met and you would have thought they had been best friends for years.... and Granison was so damn endearing as Herb. As for Alyse and Tabitha....Monia Ayachi and Heather Berg were friends of ours. I am grateful to both of them for putting together my taboo lesbian scene. Seriously, two wonderful actresses and just two people in general I adore. Do talk about the shoot as such for a bit, and the on-set atmosphere? Well I know I talked a lot about this already in previous answers. I do want to say this. I have so much fun on set... and I am adamant about being surrounded by both actors and crew that feel the same. Filmmaking can be hard sometimes. Long hours. Sometimes you have to deal with the elements, which can make it rather difficult. My cinematrographer Brandon and I always walk on set with an idea of what we want to shoot. It is only fair to the crew and the actors that I give the prep time needed on my end to make sure we make our days and have a movie that everyone can be proud of. Let me put it this way, I want to make movies that my mother would watch and enjoy. Ok, well not always... she isn't a fan of horror. But I think you know what I mean. Because I have such a joy of making movies that usually creates a fun atmosphere on set. What can you tell us about critical and audience reception of The Purpose of Apples so far - and where can the movie be seen, actually? I am excited to share that the reception of this film has been extremely positive. We contacted an indie artist by the name of Gareth Asher to ask if we could use the song "Break" in the opening sequence. We sent him the final edit of the film and he approved of the movie. It's those simple moments that prove to me we did something good. At this time we are submitting to festivals. Just like any film it has to run its course. Once that is done it will be available for viewing on our YouTube channel and our Vimeo site as well as on our website. Any future project you'd like to share? Well I have two features that are in pre-production. A horror film written by Kerry Fleming and Victor Miller (writer, Friday the 13th) called Rock Paper Dead and a Latino drama I wrote and will direct called You Can Call Me Eve. All information about me or my films is available on most social media sites. Well I do host a networking event for filmmakers and actors called the East Side Indie Filmmakers Group. We meet once a month here in Los Angeles. We always have amazing talent come through. But we are also on Facebook and have a website. I would love to start chapters all over the country to help other filmmakers meet and create their own projects.